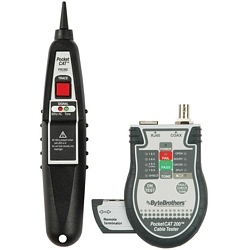 Get instant verification of your CAT5/6 network cables with the handheld Pocket Cat tester. It performs complete TIA568 tests on every wire pair, identifying continuity, opens, shorts, reversals and splits. With its built-in tone generator and the included tracer probe, you can easily identify connected network cables and live AC wires. The Pocket Cat is ruggedized for field use (no LCD to break) and the included remote stores in a hidden drawer. Includes CAT6 patch cable, coax terminator, belt clip, 9V battery and zippered pouch.